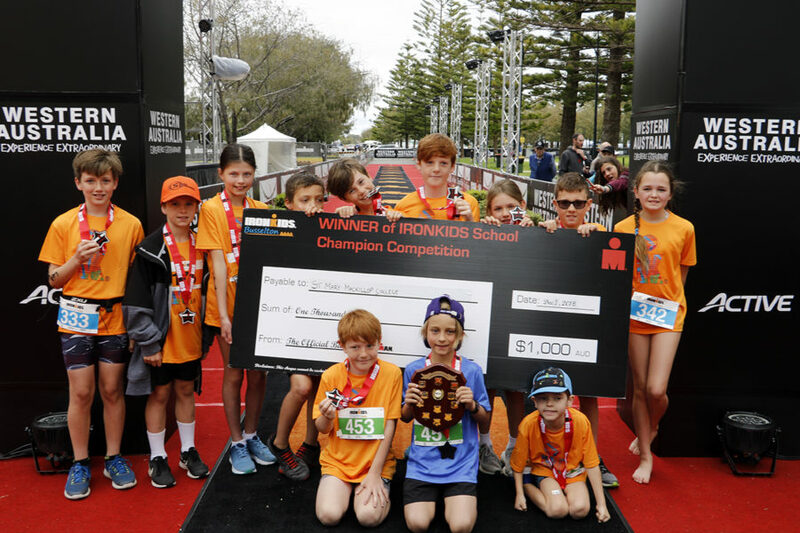 St Mary MacKillop College has once again brought home the trophy for Champion School at the Busselton IronKids event this year, with more than 35 students from the College participating in the annual triathlon festival for ages 7-13. College staff member, Mrs Vanessa Philp, who was also volunteering at the event, accepted the trophy and cheque for $1,000 on behalf of the College. Head of Phys Ed, Mr Paul Culnane, said the cheque will go towards new sporting equipment for the students. 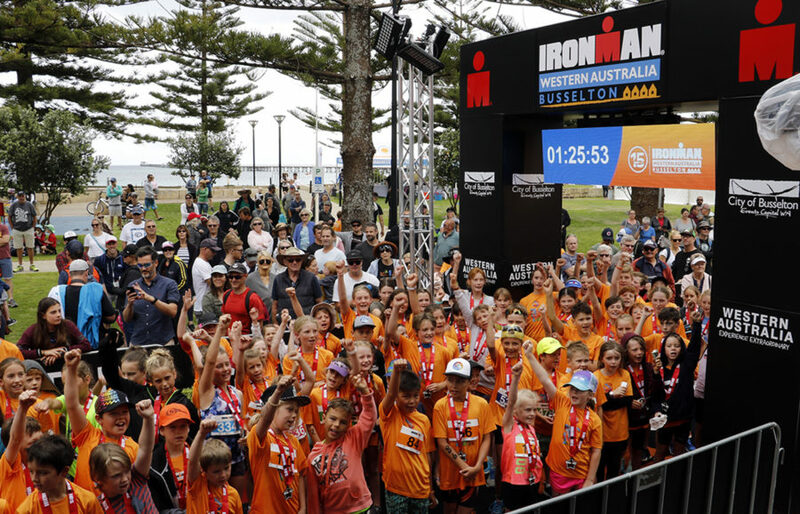 Plenty of local kids and visitors participated in the event this year as an opener for the Busselton Ironman and 70.3 races on the Sunday. 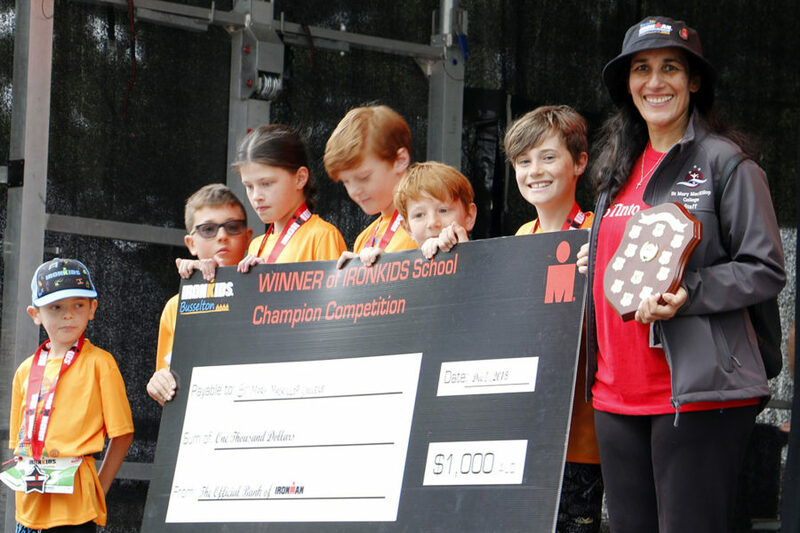 There was a 100m swim followed by a 2.25km bike ride and finishing with a 1km run for 7-10 year olds, while 11-13 year olds completed a 200m swim, 4.5km ride and a 2km run. Saturday’s race also included a Family Wave event where parents could join the children, and the Brennan, Blackford and the Priest families were amongst those spotted in the race. Many parents agreed that the kids thoroughly enjoyed participating and experiencing the buzz of crossing the finishing line to the cheer of spectators. It was a great learning experience for them to see how the transitions work between the different legs, and to manage these themselves during the race.